It’s funny how a frame of reference can get warped to the point that we can’t see a good thing when it’s right in front of our faces. The 2011 Camaro SS is this type of good thing. Some muscle car fans get so trapped in nostalgia to the point where they refuse to even consider a modern muscle car like the 2011 Camaro SS. Don’t get me wrong there’s something very special about classic muscle cars however getting so caught up in this golden era can tend to make one forget about the fabulous current modern muscle car offerings from Chevrolet, Ford, and Dodge. Don’t believe me? Well, take a look at Chevrolet’s new Camaro SS and its performance figures and it is easy to see that it would blow away even the hottest of all the muscle car era Camaro offerings. The hottest of the Camaro offerings during the golden era was the 1969 Camaro ZL1 which was an ultra-low production muscle car that Chevrolet originally intended to sell to professional drag racers – Chevy only made a total of 69. The ZL1 (RPO ZL1) V8 engine had an aluminum engine block, heads, and intake – the (V8) engine displaced 427 cubic inches and generated according to Chevrolet 430 gross horsepower (a figure that was underrated by Chevrolet). The Camaro ZL1 only weighed 3,300 lbs and in stock form went 0-60 mph in 5.3 seconds and the 1/4 mile in 13.16 seconds at 110 mph. Back in 1969 it did not get any better than this. Now let’s compare these performance figures to the 2011 Camaro SS LS3 rated at 426 net horsepower, which does the 0-60 mph run in about 4.6 seconds and the 1/4 mile in approximately 13.0 seconds at 110 mph. Where this gets interesting is that the new Camaro SS weighs in at a portly 3,860 lbs which is over 600 lbs heavier than the 1969 Camaro ZL1. However the LS3 powered 2011 Camaro SS may on paper be rated at 426 horsepower, first this figure is more than likely a little low, second the new Camaro’s 426 horsepower is the “net” rating whereas the Camaro ZL1’s 430 horsepower was a “gross” rating which was the common pre-1972 rating system. Gross horsepower ratings will naturally be higher since horsepower is measured from the engine without any accessories (robbing horsepower from the engine) whereas with net ratings the horsepower is measured at the flywheel. It’s safe to say that the 2011 Camaro SS’s LS3 would under the old “gross” horsepower rating system be at least 500 horsepower if not more. And the old ZL1 was crippled with prehistoric tire technology – skinny tires that did not grip well while the new Camaro SS has meaty tires that grip the pavement with authority. Also worth noting, the 1969 Camaro SS (the SS was considered the high performance Camaro model for 1969) came standard with a 300 gross horsepower 350 CID (small-block) V8 – for comparison a base 2011 Camaro with the 3.6 liter V6 produces 312 net horsepower – how in this respect the times have certainly changed for the better. Chevrolet also offered three different versions of its big-block 396 CID V8 in the 1969 Camaro SS which had the following gross horsepower ratings: 325, 350, and 375. There’s no doubt that the hottest 1969 Camaro SS was the 375 horsepower 396 V8 however its 6.8 second 0-60 mph time and 1/4 mile of 14.7 seconds seems slow by today’s performance standards. The 430 horsepower ZL1 427 and 425 horsepower 427 (special order COPO) Camaros were the hottest tickets in the 1969 (the 425 horsepower 427 was just slightly slower than the ZL1) – both in stock form can’t beat the new LS3 equipped 2011 Camaro SS. So what does this all mean? Very simply the rare expensive COPO Camaros back in 1969 were out of reach of most muscle car buyers. Today a new LS3 equipped Camaro SS which is faster is within reach for many buyers. There’s no special ordering to get one, just about every Chevrolet dealership will have a good selection of them on the dealer lot – providing a lot of mega power for the masses. This is big progress and I mean really big. Let’s go back in Camaro history and see how much things have really improved. In 1977 Chevrolet brought back the Camaro Z28 after a few model year hiatus, the Z28 had replaced the SS as the Camaro’s main performance model by 1974. Though the times were tough on performance cars, the best the Z28 could muster was 185 net horsepower from a small-block 4-bbl 350 CID V8. Now let’s fast forward to 1982 when the third generation Camaro made its debut, the Z28’s hottest motor was a Cross-Fire fuel injected 305 CID V8 making 165 net horsepower. When the fourth generation Camaro was introduced in 1993 things were on the way up with 275 horsepower on tap from the Z28’s fuel injected small-block 350. And then in 2002 – the year when Camaro production came to a close for awhile – the hottest Camaro was a SS model with 325 horsepower. So in this light a 2011 Camaro SS LS3 with 426 horsepower is absolutely stupendous – an event not foreseen even a few short years ago. Unlike the muscle car era when the Camaro SS had a lot of different engine options, there are only two available for the 2011 SS. Chevrolet in this respect makes it simple – if you get a Camaro SS equipped with the (Tremec TR6060) 6-speed manual transmission you get mandatory the 6.2 liter V8 LS3 rated (as mentioned before) at 426 horsepower and 420 lb-ft of torque. And if you opt for the (Hydra-Matic 6L80) 6-speed automatic transmission equipped SS, a L99 – 6.2 liter V8 rated at 400 horsepower and 410 lb-ft of torque is your only choice. This is definitely a change in comparison to the fourth generation Camaro where the hottest motors had the same horsepower rating irregardless of the transmission choice or the third generation Camaro where the hottest engine options during most years tended to be only available with an automatic transmission. The LS3 needs no introduction, it’s part of GM’s popular LS V8 family which has been around since 1997 with the original release of the LS1 in the 1997 Chevrolet Corvette. The LS1 produced then a healthy 345 horsepower. Since then there have been many variants of this pushrod 2-valve per cylinder (LS) engine architecture. The LS3 was first released in the American market on the 2008 Chevrolet Corvette. The LS3 is 6.2 liters which equates to about 376 cubic inches of displacement, it was the largest displacement modern pony car V8 engine when the all-new 2010 Camaro SS was released – the Ford Mustang at-the-time in Shelby GT500 form was only 5.4 liters and the SRT8 version of the Dodge Challenger was 6.1 liters. The LS3 has a bore and stroke of 4.06 and 3.62 inches respectively. 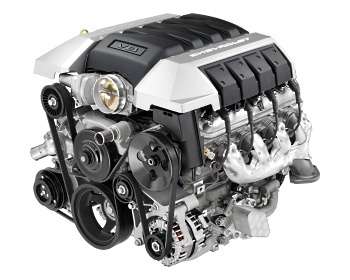 The LS3 uses high performance heads taken from the L92 (another LS V8 variant also displacing 6.2 liters and found in GM’s truck/SUV line). The L99 V8 is in essence a LS3 with Active Fuel Management which is GM’s cylinder deactivation system. The L99 uses a different intake manifold than the LS3 in order to accommodate this system. The Active Fuel Management as expected gives the 6-speed automatic equipped Camaro SS slightly better gas mileage than the LS3 equipped SS (L99 SS – 16 city mpg/25 highway mpg versus the LS3 SS – 16 city mpg/24 highway mpg), however according to GM this system accounts for the lower horsepower rating. Now here’s where it gets real interesting, with 26 horsepower deficit you would think the L99 is slower than the LS3 – it is not the case. The reason is either the ultra quick shifting computer controlled 6-speed automatic transmission of the L99 eliminates this deficit or the deficit is only on paper. Never-the-less the LS3 and L99 in stock form are fairly evenly matched. And if you are leaning towards the L99 but want to manually shift the gears on occasion Chevrolet does provide its TAPshift paddle shifter which has controls easily assessable with your fingers while your hands are on the steering wheel. The 6-speed manual equipped SS has a rear axle ratio of 3.45 versus the 6-speed automatic’s slightly taller ratio of 3.27. Where the LS3 is the wise choice is when an owner plans on adding some modifications or performance bolt-on parts, it’s a lot easier to add horsepower on the LS3 verses the L99 which is straddled with the Active Fuel Management intake manifold. There are no aftermarket performance intake manifold replacements at this time for the L99, however that will probably change since GM seems committed to expanding the Active Fuel Management system across the LS engine lineup in the future (especially with the big expected uptick of the federally mandated Corporate Average Fuel Economy standards right around the corner). And no matter which V8 engine you chose, both are equipped with a sweet sounding dual exhaust system. It provides a nice mellow V8 sound that comes to life the harder you hit the throttle. And the system is good enough to make you want to shut the stereo off and lower the side windows to listen to the beautiful resonance emanating from the dual exhaust tips out back. There’s no denying it that the mega horsepower under the hood is attracting many to Camaro SS ownership. However the fantastically executed exterior lines are also doing its part to sealing the deal. It has been a long (and I mean a very long) time since a Camaro had body lines this attractive. Chevrolet was the Johnny-come-lately back to the pony car market with the Ford Mustang remaining true during the 2003-2009 model years where there was no new Camaro available and Dodge beating Chevrolet back to the market with the release of its Challenger SRT8 for 2008. However Chevrolet made the return of the Camaro special with lines that were very modern yet also retro. 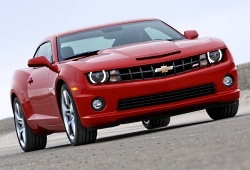 The very attractive front grille and twin round headlamps are a nice modern tribute to the revered 1969 Camaro. The rear tail lamps are a modern interpretation of the 1970-1973 Camaro rear tail lights. The general lines show a modern interpretation of the 1969 Camaro however there’s an interesting twist – the windshield is so steeply raked it takes on the appearance of an exotic sports car. And the roofline has the basic flow and shape of the 1969 Camaro except it’s chopped so it sits so low – a revolt against the retro look. However with all that being said the chopped roof and the modern retro lines on the rest of the car does work. By far the Camaro is the wildest of the new pony cars with the Dodge Challenger and Mustang being more conservative in appearance. The styling also is an optical illusion of sorts, when looking at the Camaro you are certain it is the smallest in proportions than the other modern pony cars. One look at all three modern pony cars and you are convinced the Challenger is the big behemoth, the Mustang is smaller, and the Camaro is the smallest by far. That is not the case, in reality the Mustang is the smallest with a length of 188.1 inches, width of 73.9 inches, and height of 55.6 inches. Second is the Camaro at a length of 190.4 inches, width of 75.5 inches, and height of 54.2 inches. And the Challenger is the largest at a length of 197.7 inches, width of 75.7 inches, and a height of 57.1 inches. For a past comparison the 1981 Camaro Z28 was the last year of the second generation Camaro, by this year the Camaro had grown to very large proportions. 1982 would mark the first year of a Camaro downsizing to a smaller size and lower weight. Here’s where it really gets strange – when you park a 1981 Camaro Z28 (which has a length of 197.6 inches, width of 74.5 inches, and height of 49.2 inches) next to a 2011 Camaro Z28, you soon realize the new Camaro is wider and taller –the old Camaro is only slightly longer. However if you compare the 1981 Camaro Z28’s curb weight of 3600 lbs to the 2011 Camaro SS’s curb weight of 3860 lbs, you can easily see the new Camaro is the bigger beast – this is a big surprise. The Camaro has always been a good handling car, the new SS is no different in this aspect. Where the new Camaro is different from older Camaros is it has a four wheel independent suspension – gone are the days of the solid rear axle. This is especially nice when you encounter rough pavement – the rear is certainly more sure footed than the older solid rear axle Camaros which liked to dance wildly on this type of rough pavement. In the skidpad (handling) test the new SS gets about .92 g which is very impressive. The Camaro SS utilizes a set of P245/45 tires on 20 x 8 inch aluminum wheels in the front. In the rear an even wider set of P275/40 tires on 20 x 9 inch aluminum wheels are present. This setup makes for some sure footed handling, but be prepared to replace the rear tires sooner than previous performance Camaros since four wheel rotation is out of the picture (due to different size wheels and tires being used on both the front and back). The Camaro SS really shines with its surefooted quick stopping power taking only 105 feet to do the 60-0 mph stop. When the 2010 Camaro SS first hit the auto show circuit (long before production was approved) the interior was one of the big surprises. Camaro interiors in the past had a budget – almost cheap look, buyers who wanted an upscale interior usually moved up to a Trans Am. However this time around there is no Trans Am, but Chevrolet has finally put in a Camaro what has to be one of the best looking interiors it has ever released. On one hand it’s modern. On the other hand it has retro touches like the gauges in the Camaro SS’s center console. Overall the Camaro SS’s interior has the Mustang and Challenger beat. The seats are very comfortable and blend well with the rest of the interior – the position of the front seats is lower than the competition – it gives that traditional Camaro feel of sitting on the floor board which any previous generation Camaro owner is very accustomed to and gives the added benefit of giving tall drivers plenty of headroom. However the new Camaro has the same problem as the fourth generation (1993-2002) Camaro where the area where the side windows meet the side doors is fairly high. Add to that the steeply raked front windshield and short side glass and you have not the most ideal setup for outward visibility. Put another way this is not the type of car you would use to teach your teenager how to drive, the parallel parking alone will scar his/her into permanently taking the bus. However current and previous fourth generation Camaro drivers will have no problems with this setup since it will be old hat for them. The longer you spend behind the wheel the more you get used to this setup, and after awhile you don’t mind it a bit. The Camaro SS is just plain fun, it has all the modern goodies you expect from a well-equipped late model car yet has a fun factor of 11 on a scale from 1 to 10 (10 being the most fun). Pull one of these off the road to an empty parking lot and you can burn those tires until the tire cords are showing (of course the rear tire replacement gets expensive after awhile). The Camaro SS is the type of car that makes you forget about all the troubles in life. Have an unbearable mortgage, have a nagging spouse, have a job you can’t stand, etc.? Well that all is irrelevant once you turn the key to fire up the SS’s powerful V8 – it’s now fun time. Best yet for a little over $30,000 it’s easy to get into new SS, load up the SS with all the goodies and you’re looking at around $40,000. Back in 2005, a 1969 Camaro ZL1 (#18 in the production run) sold for $840,000 at a Mecum auction – it’s one of the best classic muscle cars you can have in your collection however it will more than likely be kept in a climate controlled museum type environment for the rest of its life (I know I would preserve it that way if I had the financial means – it’s just too valuable to be doing burnouts with it). Right now you can mosey on down to your local Chevrolet dealership and buy a new 2011 Camaro SS – costing less than 4 percent of this ZL1’s selling price – with better all around performance and reliability than the ZL1. Forget about the myths and muscle car folklore, when it comes to owning the ultimate high performance Camaro, the 2011 Camaro SS is as good as it gets. It just does not get any better, however when the 2012 Camaro Z28 arrives with an estimated 550 horsepower – I may be eating my words.